I’m guilty as charged for neglecting my blog since last week. My day job has been driving me crazy busy and unfortunately, I need to sacrifice some of my personal time to meet some work deadlines. Besides the lack of blog posts, my appetite has suffered as a consequence of work-related stress. Anyway, I’m in serious need of taking a breather, as the saying goes ” all work no play makes Emily a dull lady” right? In effort to de-stress, I need to occupy my mind with something else besides work. Also, life can be a little lacklustre with an empty cookie jar laying on the table. So to kill two birds with one stone, baking seemed to be a wonderful idea. That said, I’m not in the mood of waiting for butter to soften or try to soften butter using microwave oven, macaroons fit my no-butter policy perfectly. Not to be confused with french macarons – the “it-dessert” of the moment, macaroon is less “flamboyant” and low key than macaron. Having said that, it doesn’t make macaroons any less welcoming to my cookie jar. 1. Preheat oven to 150 degrees celsius/ 300 degrees fahrenheit. Grease or layer oven trays with parchment papers. 2. 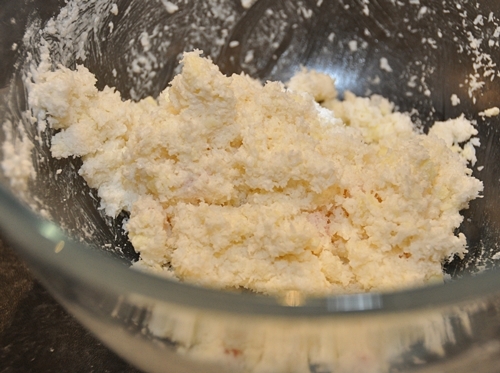 Beat egg whites in small bowl with electric mixer until soft peaks form. Gradually add sugar, beating until dissolved after each addition. 3. Stir in sifted flour, coconut, chopped turkish delight (keep 28 pieces for decoration later) and chocolate, in two batches. 4. 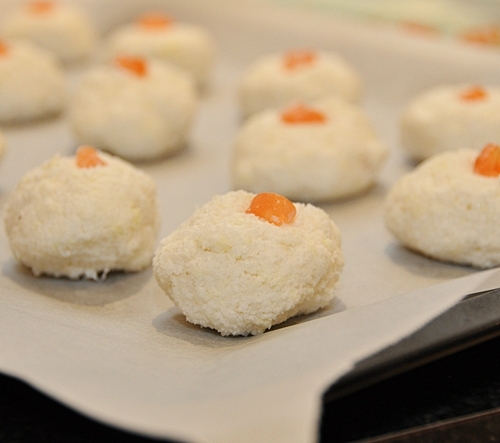 Using wet hands, roll rounded tablespoons of mixture into balls. 5. Place about 5 cm (2 inches) apart onto trays. 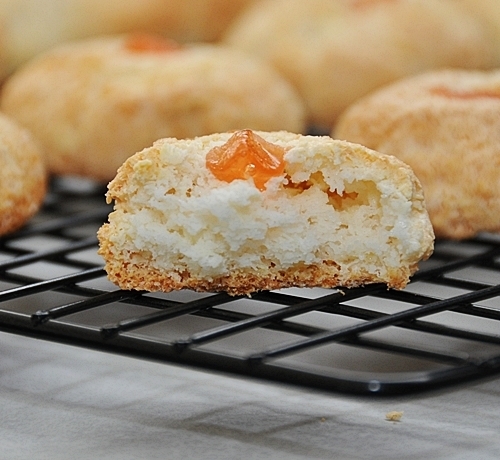 Press a small piece of turkish delight on each macaroon. 6. 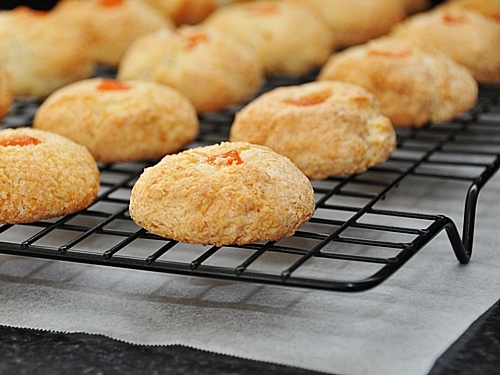 Bake them for about 25 minutes; cool on trays. Emily’s Note: This is my experiment to bake with turkish delight. Since they are quite sticky to handle especially when you try to snip them into smaller pieces, you can try dried cranberries (based on the original recipe from the book) intead. 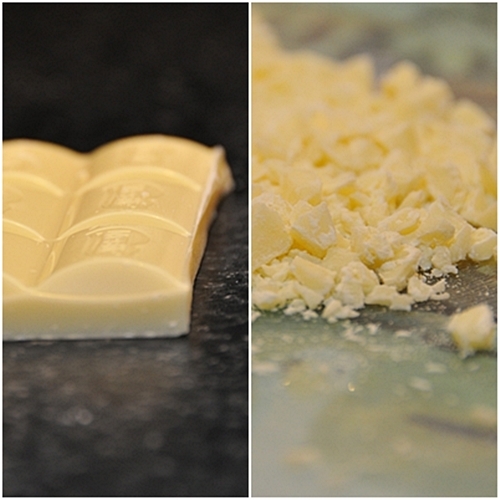 Just add 45g of dried cranberries in replacement of turkish delight and 1 tsp of vanilla extract. Also, remember to set aside 28 whole cranberries for decoration. These are beautiful Emily! I’m sorry to hear about your work-stress. I know how you feel. Hope these beautiful delicious looking cookies make your stress go away! I might try with dry cranberries. Can I use shredded coconuts instead? Have a bunch of them left. Love the photos and hopefully next week is less stress for you, Em! And yes, you can use shredded coconuts. Your Macaroons look delicious. 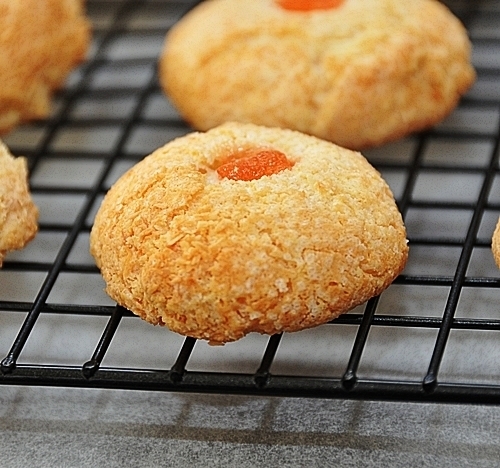 You know I always thought macaroons were the coconut cookies, not the “it-dessert” ones. One day I looked up the spelling and the “it-dessert” is spelled Macaron. But I think I like the low key Macaroons better 🙂 Hope the cookies helped de-stress you. Well, I like eating both macaroons and macarons. 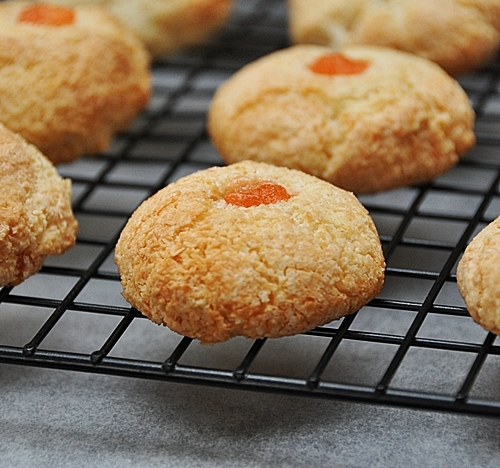 But when it comes to baking, I think baking macaroons is far easier than the latter mainly I don’t like to pipe batter when I’m short of time. What a creative idea! these are gorgeous! These are beautiful! 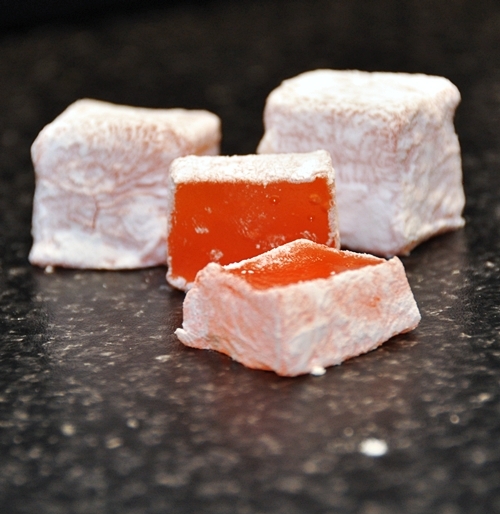 I’ve never tried my hand at making Turkish Delight but now I want to…gorgeous! Hi, these look ‘smore’ish. You could try dipping your scissors into some corn starch to prevent the turkish delight from sticking too much. Definitely gonna give this a try, have some delight in the pantry at the moment (cherry) that is too sweet on it’s own. It will be perfect. Thanks for the recipe! oh wow, turkish delight. I really want some of them! Beautiful and delicious! Great recipe! I tried it and had my husband bring some to work, all his colleagues loved it! It turned out good and delicious but I still wonder about one thing though, mine did not look like the ones you made, maybe your dessicated coconut were finer, or can it be with how I stirred the flour and the other ingredients in step 3? i did not use my electric mixer to do it, instead i used a regular spoon. I’m a beginner in baking so I hope you can help me with my question. The desiccated coconut that I can get access to in the supermarket is the fine version (the other version would be shredded coconut). I just realised I didn’t specify in step 3 but I actually stir the mixture with a spatula (so a spoon would be fine too). So I don’t think it is how you stir the mixture in Step 3, it’s more like the type of desiccated coconut you use. I’m not sure if there is any other kind of desiccated (in terms of the size of the coconut particles) as the supermarket I go to, it has only one type. If you like, you can take a photo of your end product, I’d love to check out your end result.